I read this one a few weeks after Mars Evacuees (or was it before???). I tend to take my time reading fun alien and ninja books, so I can make the enjoyment last (I’m that one person who believes there will never be enough literature on either). This is the first in a new series, out to the masses via Harper Collins, on March 31, 2015. So don’t rush off to grab it now- it’s not out yet! I usually don’t like to review the books that far ahead of time, because I hope that someone will read the blog post and maybe pick up a copy if I unequivocally dug it. (It’s blogger’s ego. It’s a condition. Truth). Anyway, the cover is fantastic. How can you NOT want to pick it up? I mean, look at it– you have the sense of ferocious battle awaiting these two around the next corner, yet there’s a sense of contagious fun about it. That’s exactly what you encounter inside. In my store, this is called “Year 8”, which is the age group of 8-12 years. Grade level is 3rd-7th, although I really think it’s closer to 4th-6th. I think it’s a bit simpler than a 7th grader with a normal reading level would normally go into, but if that 7th grader isn’t the best reader, this is perfect. Again, just my opinion. It’s just like having that customer walk into a store and want a book for a 9-year old, but you know nothing about what he likes or his reading abilities. (Be not surprised, dear reader. It happens- just yesterday, in fact). I enjoyed it quite a bit, I just think it’s a bit too young for my reading tastes, but it’s a good, fun book for your young one. Joey and Johnny are best friends, and more opposite best friends cannot be found. One follows the rules, the other doesn’t care that they exist in the first place. Joey’s a planner, Johnny leaves everything to chance in the wind. Johnny’s wild and crazy and dresses as thus; Joey’s a straight shooter who takes everything very seriously. Two boys couldn’t be more different, but they bond as they attend Kick Foot Academy, a school for ninjas. Wanna-be ninjas, I should say. 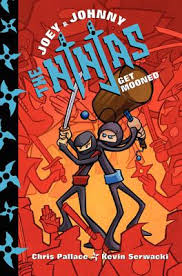 Their rivals are The Red Moon Clan, and that rivalry is renewed when the Red Moon Clan suddenly gets ahold of some very cool, state-of-art weapons that they normally would not have possession of, and they challenge Kick Foot Academy to a Test of Three, which ends with a Battle Royale that will declare which ninja school is really the victor. The battle itself is epic, and the end is not the end- of the series, thankfully. I can’t wait to see what happens in the next one! This is a fun and silly book that will appeal to those who enjoy Origami Yoda, and to adults too. ~ by generationgbooks on December 3, 2014.